I found about 6 dozen of these blank PCBs in a drawer, from some past lifetime. They're pretty generic, with 12 IO brought out on headers, and a 75175 serial translator. They were designed to go on a little ribbon cable network, but of course they can be used alone. I was thinking of giving out 3 per customer, with preference to students and noobs. I'll pay postage in the USA - if you want to send me any money in return, just give it to somebody locally who needs it. If you're out of the USA, we'll have to talk about it. I don't have the schematic anymore but trust me, it'll be trivial to figure out the connections. Board markings notwithstanding, it will take any of the mega--8 family, and of course any crystal (or no crystal at all). What you'll be getting is the blank PCB, -not- the stuffed one. No responses yet. That may be because the PCB is rather worthless to people, I could understand that. Or it may be that my conditions were too strict. So now I'll open it up - student or cantankerous old professional, if you want a few of these, message away. Otherwise I'll have to revive this post every year at Christmastime. 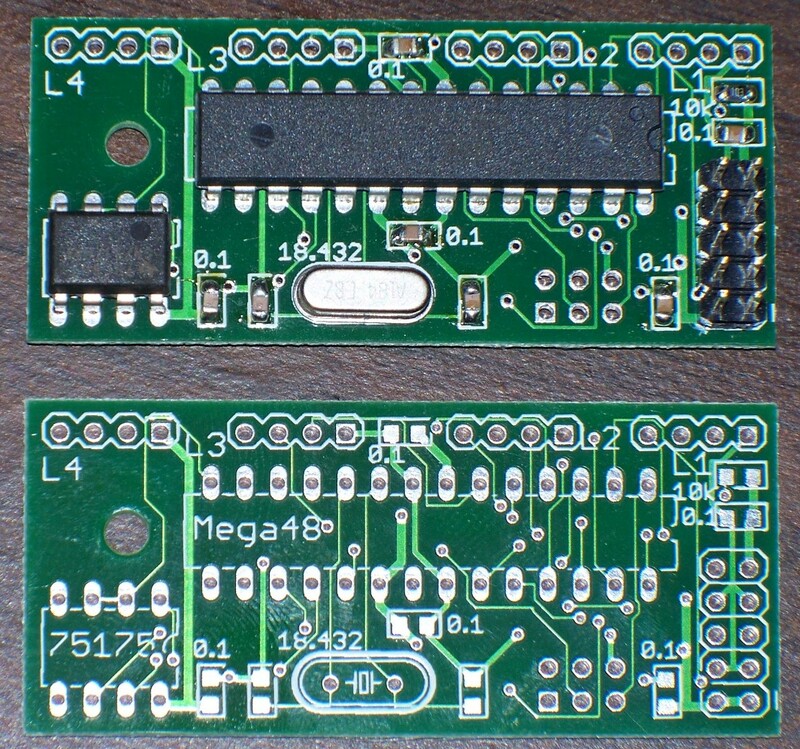 DocJC pointed out that the 8-pin RS485 chip is a 75176, not 75175. That's what happens when software guys design hardware.